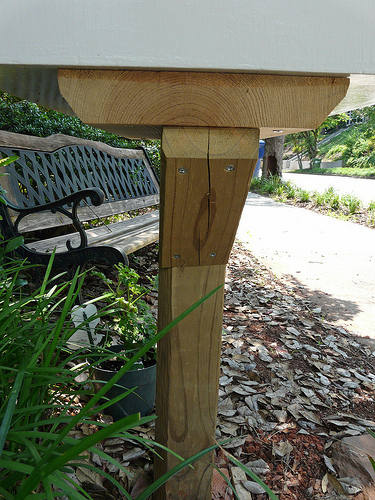 A few weeks ago we began blogging about Highland Woodworking owner Chris Bagby and his wife Sanne’s progress with the installation of a Little Free Library in their front yard in Atlanta, GA. The Little Free Library is a nationwide community movement project that involves the creation of a birdhouse-sized structure that is placed in your front yard and then filled with books that can be shared with others in your neighborhood. Sanne has been keeping track of their progress through her own blogging and today’s blog features the theme of the library as well as the physical placement of the library in the yard. It’s time to execute the theme for our library. 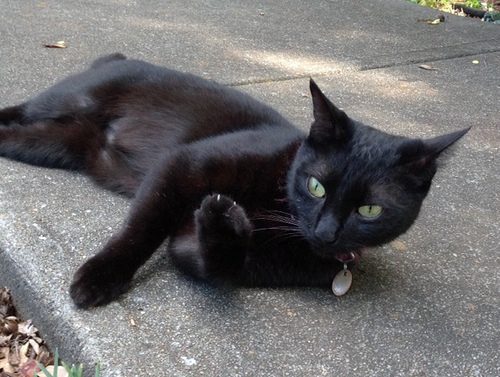 Our little black cat, Bo (short for Bodacious) is the love of the neighborhood. This friendly little guy has endeared himself to just about all of the kids and adults for blocks around our home. He even has some feline and canine friends in the mix! 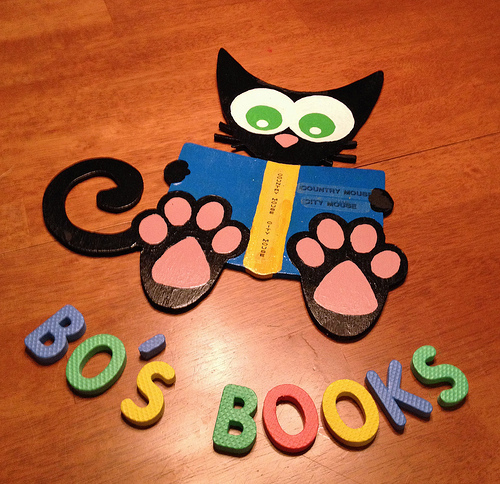 Chris came up with the idea of “Bo’s Books” as the name of our library, and that was all I needed to hear. I scoured the internet for cat images and found a delightful little clip-art cartoon, complete with a book. I traced an outline onto a piece of luan and Chris cut out the shape using the scroll saw. I proceeded to sand and paint it. A few modifications to the original design to make it look more like Bo, and then it was complete. I gave a title to the book Bo is reading, a tongue-in-cheek impulse: “City Mouse, Country Mouse!” Hope this makes some people laugh! I found a leftover piece of the luan, shaped it using the scroll saw and then painted it black. I bought some colorful foam letters to spell out the title. I glued the letters onto the board using contact cement. These luan boards will be mounted onto the side of the library cabinet. Bo hovered around constantly while all this activity took place. I think he was aware that he was being “copy-catted,” but it was difficult to tell whether he was annoyed or flattered by it! I think it’s a good likeness, don’t you?! Now that the library is fully constructed and decorated, it is time to set it up in its permanent home. We know exactly where in our front yard that we want to place it, but we experiment with the placement of a bench nearby. We settle on a placement that is sheltered under a crape myrtle tree with the bench situated at an angle next to it and in front of a lovely shrub that spans ours and our neighbors’ yard. Our neighbors are delighted with our LFL plans and give us permission to trim the shrub and even loan us an electric trimmer that gets the job done in a hurry! We remove the many tangled vines that have crept high into the shrubs and trees that circle the area. The monkey grass that’s growing where we plan our cozy little library spot has gotten tall and crowded. I haul out the garden tools and we begin digging out the various clumps. They are heavy and the roots are well-established and tangled. We manage to fill two large wheelbarrows with massive clumps. It’s hard work but satisfying to see the area, now cleared of the the monkey grass and filled with small stones instead. 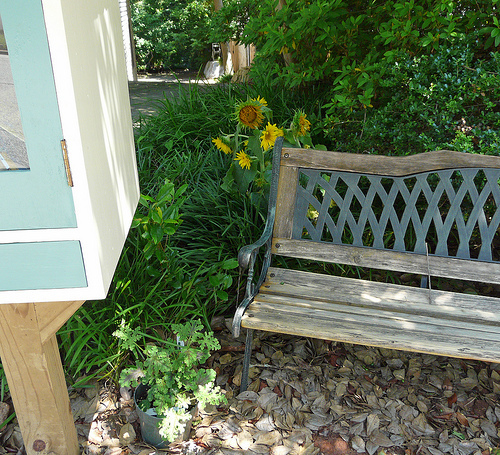 We transplant some of the monkey grass to the edges of our driveway and to an area behind the bench and library cabinet. This creates a nicely defined and sheltered nook for users to browse through the books. I used the palm sander to smooth out the wooden slats on the bench – we don’t want anyone to experience any unfortunate splinters! Chris finds a 6’ length of 4×4 left over from our deck construction 20 years ago. He follows the instructions for building the post and mounting platform. It calls for a 5-foot post sunk into the ground at a depth of 2 feet. We try this, but it looks too high. Younger children will not be able to even reach the bottom of the cabinet and only the tallest adults will be eye-level with the upper shelf. Chris lops 10 inches off and we try again. Still too high, I say. Chris saws off another few inches. The cabinet now sits only about 24 inches off the ground, which seems perfect. While the grown-ups may need to bend a bit to find their books, all but the youngest children (who likely would need supervision anyway) will be able to help themselves to the books – Viva L’Independence! We’re nearing the “finish line” of our project. 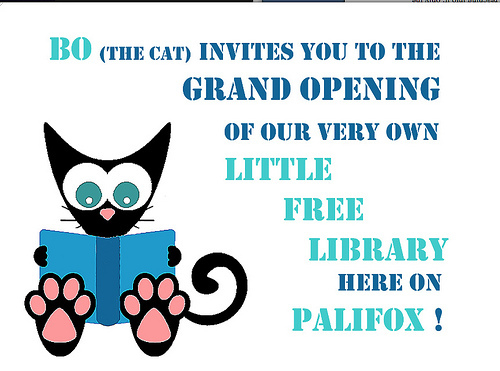 Time to invite the neighborhood to a Grand Opening – I went around the neighborhood in the final week of working on the LFL, leaving invitations “from our cat, Bo,” on everyone’s mailboxes to come to the “Grand Opening” of the newest neighborhood Little Free Library. CLICK HERE to see the final blog post about the project, with the Grand-Opening of Chris and Sanne’s Little Free Library!